I’m searching for strong gravitational lenses. They are really interesting! One of the tenets of the General Theory of Relativity is that space is curved by the presence of matter and energy. This curvature is what we experience as gravity – a fascinating subject in its own right. General relativity – a revolutionary and controversial theory in 1915 when Einstein published it – made the prediction that the curvature of spacetime caused by massive bodies like stars would deflect the passage of a ray of light*. Einstein did the calculations and predicted that a light ray passing very close to the sun would be deflected by a small amount – 1.3 arcseconds, or about 1/2800 of a degree. Thus, a star positioned just at the edge of the sun would appear to shift slightly to a different position in the sky because of this bending. A concrete prediction like this one provides an opportunity to test a new theory in the court of empirical evidence. But the problem for Einstein was that stars are a little hard to see during the daytime – let alone when they are right next to the edge of the sun. Luckily, a total solar eclipse occurred in 1919 and this provided an opportunity to put this particular prediction to the test. The British astronomer Sir Arthur Stanley Eddington travelled to the island if Principe, where the total eclipse was visible, and took photographs of the sun from which the deflection could be measured. Of course, it was a match, and the prediction was borne out perfectly. It was Eddington’s expedition and subsequent vindication of the theory that grabbed headlines around the world and first made Einstein a household name. As an bonus, in a Europe exhausted by World War I, this collaboration of an English pacifist (Eddington was a Quaker) helping to prove a German theorist correct, was quite a showcase for the international society of science. If the sun can bend the light of a star, what could a more massive body do? Through the 1920s and 1930s the existence of other galaxies and their place in the vastness of the cosmos came to be better understood. Among the astronomers who were thinking about the implications of general relativity, gravity and light was the Swiss Fritz Zwicky. 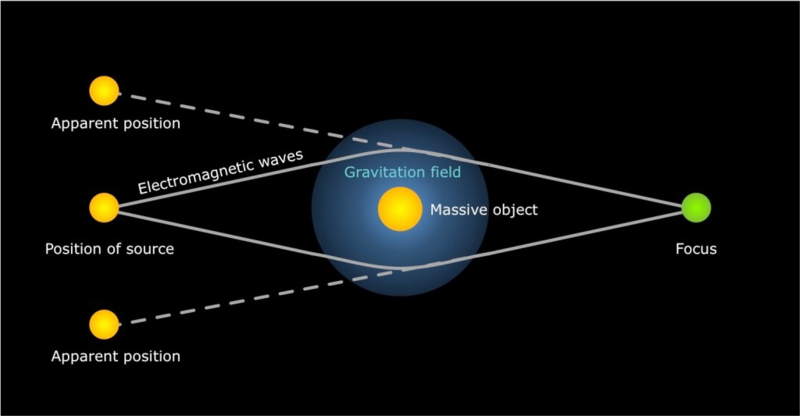 One of Zwicky’s claims to fame is being the first to postulate the existence of dark matter, but in 1937 he suggested that galaxy clusters could act as gravitational lenses – bending distant light such that it was both distorted and magnified, just like an ordinary lens. The theory predicts multiple images of a distant light source might be present, and in some circumstances, the source could be stretched out into an arc or a complete circle – an “Einstein Ring”. For a long time it was assumed by many that such an event would never be visible in practice; Einstein himself was of this opinion. What are the chances of things lining up so perfectly? Fortunately, thanks to telescope improvements and a growing understanding of the cosmos, lensing moved from the hypothetical to the possible in the minds of astronomers. However, it wasn’t until 1979 that a likely candidate was found, in the “twin quasar” Q0957+561. 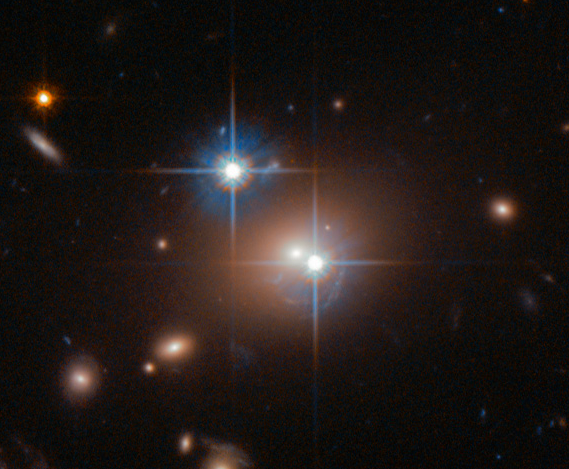 Walsh, Carswell and Weyman found what looked like two very similar objects close together in the sky, but due to the similarity of the objects, the fact that they happened to be at the same distance, and the presence of the possible lens galaxy in the middle, they suggested they might have found an elusive gravitational lens. Their discovery met with considerable skepticism but they were soon proved correct. Today, we know of hundreds of lenses across the sky. However the universe is a big place, and those remaining to be discovered number in the tens of thousands or more as we see deeper and further back in time. Lenses are inherently beautiful and interesting, at least if you an astronomer, and so finding them and cataloguing them would be a worthwhile endeavour no matter what. 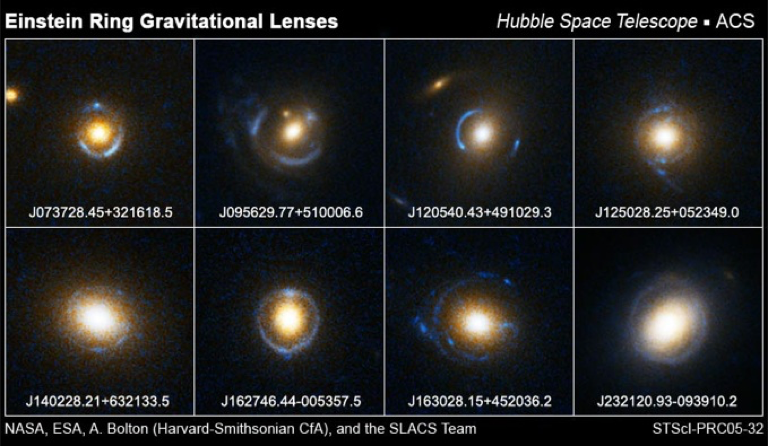 However, gravitational lenses turn out to be as useful to astronomers as their glass analogues in telescopes. Since the bending of light depends on the mass of the galaxy, if you can observe the bending, you know the mass – not just the gas and stars that make up the stuff we can see, but the dark matter that makes up the vast majority of the mass in the universe. Other aspects of lensed systems, such as the time delay between the different images of a multiply-images source (such as the “Twin QSOs” above), can help cosmologists probe the fundamental parameters of the universe such as the Hubble constant, H0. Images of strong lenses taken with HST, including clear arcs and Einstein rings. Lenses are beautiful, interesting and scientifically useful, but rare. How do we find them from among hundreds of millions of galaxies on the sky? That’s my project, so stay tuned. *It’s true there was a Newtonian prediction as well, based on the assumption that ‘corpuscles’ of light must have some mass. But the prediction deflection was half what GR predicted.